I am an artist-painter and tutor. I have lived in Ashburton for many years. Landscape and landscape-based abstracts are my current main interest. I believe painting should prompt viewers to ask questions, not just about the subject matter, but also about themselves. Dartmoor and other local scenes that I know well feature as my starting points. My studio paintings are mainly oils or acrylics. However, I also enjoy working in watercolour and mixed media in various combinations, all sorts of drawing, applied to a wide range of subjects, with a recent revived interest in still life. I am inspired by a host of painters, mostly from the hundred years or so from about 1870 to 1970, that still seem to point the way down so many avenues of exploration. Three that I keep finding myself returning to are: Ivon Hitchens, Patrick Heron (late works,) and Barbara Rae. 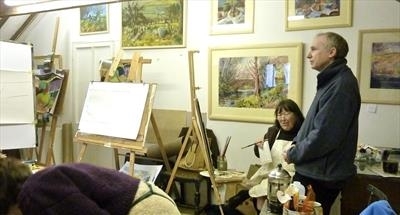 I tutor both individuals and groups, including two weekly morning workshops in my studio in Chudleigh. For more details, see the "Classes & Art Workshops" pages. 1982 Dip HE Art And Design in a Social Context. Dartington College of Arts. 1951 Born Bournemouth, childhood in the New Forest, and later school in Devon. 1969 'A' level Art, A grade. 1969 St. Andrews University, Fife. Co-founded, edited, illustrated and contributed prose and verse to 3 editions of a Literary-Arts magazine called “Entry". 1973 Lived in Fife until 1979 practising a variety of craft and art activities, including textiles and topographical line drawings. Employed as a Small-Finds Draughtsman by Perth High Street Archaeological Dig and also as an Artist drawing reconstruction views of the medieval city. Exhibited paintings, abstract and figurative, in St. Andrews Festival and elsewhere. 1979 Moved to Somerset, produced another series of local line drawings as prints and greetings cards. 1980 Devon, Dartington College, H.E. qualification in “Art and Design in a Social Context,” with a special interest in murals and public art. 1985 Creative Writing Apprenticeship Bursary from the Arvon Foundation, and forays into Teaching English as a Foreign Language. 1991 Adult Education Tutor in Brixham and Totnes, and other A.E. Centres, Community College Departments, and the W.E.A. Mainly teaching Watercolours, but also Oils, Art History, Drawing-and-Painting, and ‘A’ level English. 5 years as Art Course Moderator for Open College Network Southwest. 2007/8 Started art workshops in First Floor Studio, Clay Door, Old Pottery Court, Chudleigh, and other private tutoring to groups in Yealmpton, Dartington, and South Brent. Courses of weekly tuition for small groups of practised and professional artists. See "The Roger Dennis Studio Painters" who exhibited at Harbour House Gallery, Kingsbridge, in 2011. Also classes for general painting, beginners welcome. 1981 solo: St Katherine's Gallery, Crawford Arts Centre, St Andrews, Fife. 1979 solo: St Andrews Festival Fringe Gallery. 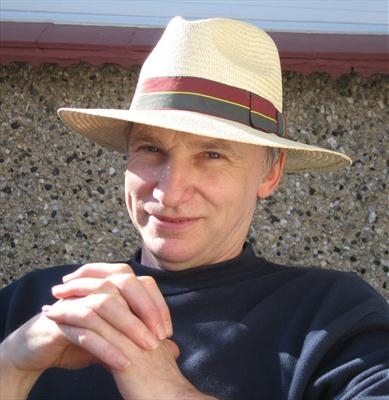 Roger has work in private collections in America; Luxemborg; Spain; and in the U.K.: Ashburton; Barnsley; Buckfastleigh; Cambridge; Edinburgh; Glasgow; London; Lincoln; Southampton; Totnes; and elsewhere.